At the beginning of the 1960, Vladimir Chelomei, the head of the OKB-52 design bureau, proposed Nikita Khrushchev to develop a series of the "versatile rockets" or in Russian abbreviation -- the UR series. Based on the each vehicle's expected liftoff mass, they received designations: UR-100, UR-200 and UR-500. Chelomei's proposal competed with several other ICBM programs developed at the time by OKB-586 design bureau in Dnepropetrovsk and OKB-1 in Podlipki. 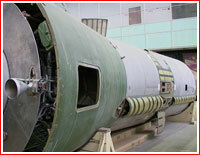 The UR-200 offered similar capabilities to the R-36 ICBM, under development in OKB-586. Nikita Khrushchev gave go ahead to both projects: the UR-200 and R-36, however only one of the vehicles was expected to be accepted for mass production. The government decrees authorizing the UR-200 development were issued on March 16 and August 1, 1961. The construction of the launch complex for the UR-200 flight tests started at Site 90 on the left (western wing) of the NIIP-5 test range in Tyuratam (today Baikonur). 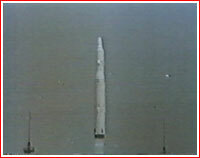 The silo launches for the UR-200 were also planned. The underground pads would be based on the Sheksna-V complex developed for the R-16 ICBM. The first stage of the two-stage UR-200 missile was equipped with an RD-0202 four-engine cluster, whose combustion chambers were designed to gimbale to control the missile in flight. The preliminary design of the UR-200 rocket was completed in July 1962. After several delays due to development problems, the first test launch of the rocket took place on November 5, 1963 and was unsuccessful. 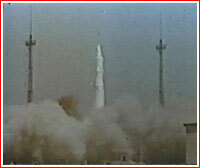 The second vehicle, launched on April 11, 1964, also failed. One more launch took place on May 15. During next two launches on May 30 and June 17, 1964, Marshall Grechko, the Minister of Defense at the time, was present at Baikonur to view the launches. One more launch took place on August 1, 1964. On Sept. 24, 1964, Nikita Khrushchev personally viewed the UR-200 launch in Baikonur, only days before he was ousted from power in a bloodless coup in October 1964. During the same visit to Baikonur, Khrushchev also witnessed the launch of the UR-200's competitor -- the R-36 ICBM developed at OKB-586 design bureau (now KB Yuzhnoe in Dnepropetrovsk). 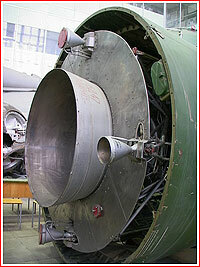 In the wake of the visit to Baikonur, Khrushchev made a decision to terminate the UR-200 project in favor of the R-36. In his memoirs, (87) published in 2000, Khrushchev's son, Sergei, who worked for Chelomei, still pondered the question why his father preferred Yangel's R-36, to the UR-200. "I don't know why, since rockets seemed almost identical," Sergei Khrushchev wrote. According to the official publication (101) of the Khrunichev enterprise, which manufactured the UR-200 missile, the vehicle was not designed to stay fueled for the long period of time a flaw significantly increasing the pre-launch processing.